The document says this step would only be taken “following successful completion of the [NOAA] Spectrum Pipeline Plan,” which encourages federal agencies to make additional radio frequency spectrum available to private enterprises. In North and South America, 28,000 sensors send data to NOAA’s Geostationary Operational Environmental Satellite (GOES) Data Collection System in the 401 MHz band. The satellites rebroadcast the information in the 1675 to 1680 MHz band. Ligado Networks, the company formerly known as LightSquared, petitioned the FCC in 2016 to allow terrestrial communications to share 1675 to 1680 MHz with government users. Ligado is seeking the band along with other frequencies for its planned 5G wireless network linking cell towers with its SkyTerra-1 satellite. Instead of displacing NOAA traffic, Ligado proposes creating a “protection zone” near NOAA sites and moving NOAA weather data into a cloud-based network. Public, private and academic organizations involved in weather research and forecasting currently obtain imagery and data from GOES instruments through ground antennas. A cloud-based network would expand access to the data and free up spectrum for 5G networks, according to a 2018 Ligado video describing the plan. Putting Ligado’s network in spectral bands next to bands reserved for weather satellites would be like putting a dance club in one room of a library, said Gerth who chairs the American Meteorological Society’s Committee on Radio Frequency Allocations. The walls would dampen the sound somewhat but “not enough to prevent it from disturbing the quiet of the reading room,” Gerth said. As for the cloud-based network, meteorologists and weather researchers worry about speed and reliability. 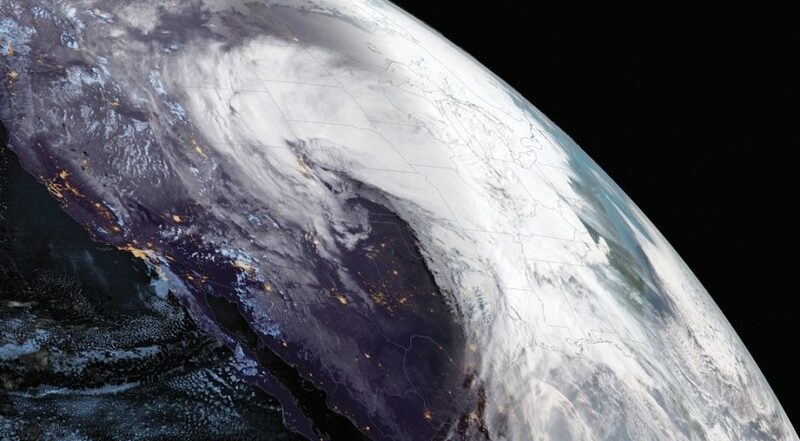 The U.S. government’s service agreement for GOES rebroadcasts allows for only five minutes of downtime in a 30-day period and all outages to be resolved within five minutes, Gerth said at the American Meteorological Society’s annual meeting in January. Service agreements for cloud networks typically allow for 50 minutes of downtime in 30 days. If an outage occurs during a hurricane or tornado it could delay lifesaving forecasts and warnings, he added.